The Buddha offers some useful life advice to anyone trying to get anything done. People will complain if you do something wrong. More people will complain if you do something right. Some people will complain if you don’t do anything at all. People just like to complain! Seven people signed up for my email newsletter in the last 24 hours. One person complained. 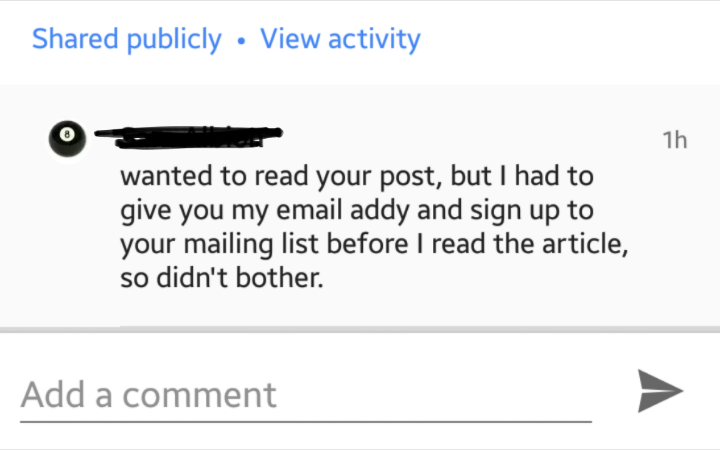 The email pop-up goes away if you click the X, or anywhere on the screen, but sometimes people get confused and think they HAVE to sign up to read my posts. Occaisionally, people complain. Here’s the thing. As a person trying to get thjngs done, YOU HEAR MUCH MORE FROM THE COMPLAINERS THAN ANYBODY ELSE. People who are generally happy with your efforts don’t often feel the need to say so. But people who are triggered by your actions often do. You’re out there doing, and taking the hits along the way. They’re not. Of course it IS possible to market and promote your work counter-productively. BUT. Those people will just unsubscribe, or unfollow, or dump your email in the spam folder. Keep an eye on your engagement rates, that’s a useful indicator. Complaints, by and large, only tell you about the complainer.